The 2006 Daytona 500 was the first stock car race of the 2006 NASCAR Nextel Cup Series. The 48th running of the event, it was held on February 19, 2006, in Daytona Beach, Florida, at Daytona International Speedway before a crowd of 200,000 spectators. The 203-lap race was won by Hendrick Motorsports driver Jimmie Johnson after starting from the ninth position. Casey Mears of Chip Ganassi Racing finished second and Ryan Newman took third for Penske Racing South. Dale Earnhardt Jr. Dale Earnhardt, Inc.
Bill Weber, Benny Parsons, Wally Dallenbach Jr.
Jeff Burton won the third pole position of his career by posting the fastest lap in qualifying. He held the lead for the first lap, and maintained it for the first 18 laps of the race until the first round of pit stops. On the 28th lap, Tony Stewart became the leader, and maintained the position for the following 20 laps. From laps 58 to 80, Matt Kenseth was in the first position, before Dale Earnhardt Jr. assumed the lead on the 86th lap. Earnhardt led seven times for a total of 32 laps, more than any other driver. Before the final round of pit stops, Johnson became the new leader by passing his teammate Brian Vickers on lap 187. He maintained the lead from Newman and Mears to win the event under caution conditions after Greg Biffle lost control of his car on the final lap. There were 11 cautions and 32 lead changes by 18 different drivers during the race. It was Johnson's first Daytona 500 win, his first at a restrictor plate track (at either Talladega Superspeedway or Daytona International Speedway), and the 19th of his career. Because this was the first race of the season, Johnson led the Drivers' Championship with 190 points, followed by Mears and Newman on 170 points each. Elliott Sadler and Stewart were fourth and fifth with 165 and 160 points, respectively. In the Manufacturers' Championship, Chevrolet led with nine points, ahead of Dodge in second place with six points, and the third-placed Ford with four points. The race attracted 37 million television viewers. The 2006 Daytona 500 was the first of 36 scheduled stock car races of the 2006 NASCAR Nextel Cup Series, and the 48th running of the event. It was held on February 19, 2006, in Daytona Beach, Florida, at Daytona International Speedway, one of six superspeedways to hold NASCAR races; the others are Michigan International Speedway, Auto Club Speedway, Indianapolis Motor Speedway, Pocono Raceway, and Talladega Superspeedway. Its standard track is a four-turn, 2.5-mile (4.0 km) superspeedway. Daytona's turns are banked at 31 degrees, and the front stretch—the location of the finish line—is banked at 18 degrees. The Daytona 500 was conceived by NASCAR founder Bill France Sr., who built the Daytona International Speedway. The race was first held in 1959; it is the successor to shorter races held on beaches around Daytona Beach. It has been the opening round of the NASCAR season since 1982, and from 1988, it is been one of four events that require cars to run restrictor plates. The Daytona 500 is often regarded as NASCAR's most prestigious race because it offers the most prize money in American auto racing. Victory is considered equal to winning either the World Series, the Super Bowl or The Masters. The race is often called the "Great American Race" or the "Super Bowl of Stock Car Racing". In preparation for the race, NASCAR held several test sessions on January 9–11 (for teams who finished in a odd-number position in the 2005 car owner points standings) and January 16–18, 2006 (for teams who finished in a even-number position in the 2005 car owner points standings). [n 1] Every test session began at 9 a.m. EST, stopped at 12:00 – 1:00 p.m. EST, and concluded at 5:00 p.m. EST. Jeff Gordon was fastest in the first session with a speed of 187.029 mph (300.994 km/h) and a speed of 187.219 mph (301.300 km/h) by Bill Elliott paced the second session. Jimmie Johnson led the third session at 186.966 mph (300.893 km/h) and Gordon the fourth at 188.466 mph (303.307 km/h). Matt Kenseth and Gordon led sessions five and sixth with respective speeds of 188.403 mph (303.205 km/h) and 189.298 mph (304.646 km/h). Kyle Busch and Sterling Marlin paced sessions seven and eight with speeds of 186.629 mph (300.350 km/h) and 187.110 mph (301.124 km/h), while Scott Riggs and Kyle Busch led the ninth and tenth sessions from speeds of 185.345 mph (298.284 km/h) and 188.119 mph (302.748 km/h). The final two sessions were paced by Dale Jarrett and Kyle Busch with respective speeds of 189.215 mph (304.512 km/h) and 190.251 mph (306.179 km/h). After a large amount of bump drafting was observed during the Budweiser Shootout, NASCAR instituted two "no zones" at the exit of corners, which series officials and multiple digital cameras would observe drivers attempting to ram their cars into the rear of other vehicles in order to gain an aerodynamic or overtaking advantage. Drivers would then be penalized with either a drive-through penalty or disqualification from the race depending on the severity of the bump. Robin Pemberton, vice-president of competition for NASCAR, stated that bump drafting in the turns would no longer be tolerated, "It crosses over the line when the drivers are in the corner. That is not a good place to bump-draft. A straight line, it's not the best either, but a straight line is far safer than in the corners. There's guys that haven't totally honed the craft of bump drafting." Six practice sessions were held before the Sunday race. The first two were held on February 11 and ran for 120 and 90 minutes each. The next two on February 15 were shortened to 60 minutes each. Two days later, one more practice session was scheduled, which lasted for 75 minutes. The final practice session was held on February 18 and ran for 60 minutes. In the first practice session, Kevin Harvick was fastest with a lap of 47.771 seconds, ahead of Gordon, Kyle Petty, Elliott Sadler, Johnson, Jarrett, Elliott, Jeremy Mayfield, Bobby Labonte, and Joe Nemechek. With a time of 47.757 seconds, Sadler led the rain-curtailed second practice session; Gordon was 0.219 seconds slower as he duplicated his first-practice result in second, and Elliott improved to third. Jarrett, Johnson, Marlin, Mayfield, Clint Bowyer, Denny Hamlin, and Kurt Busch followed in positions four to ten. Kurt Busch hit a large section of cardboard on the back stretch, causing the session to be stopped after an hour. Jeff Burton (pictured in 2007) had the third pole position of his career and his first since 2000. Although 58 cars were entered in the qualifier; according to NASCAR's qualifying procedure only 43 could race. Each driver ran two laps, and unlike most races during the season, the qualifying session determined the first two positions, while the rest of the drivers qualified by the 2006 Gatorade Duels. Weather conditions were cold with a tailwind. Jeff Burton was the 34th driver to set a lap time, and he took his first pole position at Daytona International Speedway, his first since the 2000 Chevrolet Monte Carlo 400, and the third of his career with a time of 47.581 seconds. He was joined on the grid's front row by Gordon whose lap 0.169 seconds slower. Kenseth was the only driver not to set a time because of a flat left-rear tire to start his lap. After qualifying, Burton said, "We just got lucky. That's the best wind we've had down here in all of testing and everything else. It just played into our hands, and we had a car that could take advantage of it. ", and, "Today had nothing to do with me. The only impact that I had on today at all was to be a warm-blooded person that could mash the gas and turn the thing on. I think Michael Waltrip once said a drunk monkey could do it, and I was a drunk monkey, I guess." After post-qualifying inspection, Johnson's lap times were deleted due to an illegal rear window template that was lowered by a track bar adjuster to the right rear of his vehicle to provide Johnson with an aerodynamic advantage. Terry Labonte also had his lap times disallowed after it was discovered his car's carburetor had unapproved modifications made to it. Both Johnson and Labonte were thus ordered to start from the rear of the field in the Gatorade Duels. Johnson did not have his primary car confiscated by NASCAR, and his crew corrected the infraction it to allow for its return to competition. Johnson's crew chief Chad Knaus was subsequently ejected for the remainder of the Daytona 500 by NASCAR, which he was not allowed to appeal, and his role was assumed by Hendrick Motorsports lead engineer Darian Grubb. Ken Schrader (pictured in 2007) set the fastest practice lap in all six sessions on Saturday afternoon. In the third practice session, Dale Earnhardt Jr. went fastest with a lap of 47.024 seconds, ahead of Kenseth in second, and Ryan Newman in third. Kevin Lepage was fourth-fastest, ahead of Scott Wimmer and Jeff Green. Kurt Busch, David Stremme, Burton, and Jamie McMurray followed in the top ten. Petty and Kenny Wallace had anxious moments while drafting other cars but both drivers were able to control their vehicles. Both Hamlin and Derrike Cope made contact with the wall beside the track, but they continued with no major damage to their cars. Brian Vickers led the fourth practice session with a time of 46.946 seconds, with Mike Wallace, Greg Biffle, Jarrett, Kenseth, Bowyer, Robby Gordon, Burton, Chad Chaffin and Dave Blaney in positions two to ten. Mike Wallace's had a tire detach and his oil line failed 15 minutes in the session. Sadler and Gordon were the winners of the Gatorade Duels. The qualifying grid was finalized with Sadler, Kyle Busch, Carl Edwards, McMurray, Earnhardt, Bobby Labonte, Johnson and Mark Martin completing the top ten starters. The fifteen drivers who failed to qualify were Scott Riggs, Kenny Wallace, Wimmer, Mike Skinner, Cope, Larry Gunselman, Chad Blount, Larry Foyt, Andy Belmont, Randy LaJoie, Morgan Shepherd, Chaffin, Carl Long, Paul Menard, and Stanton Barrett. Marlin switched to a back-up car after he was collected in an accident in the first qualifying race. Nemechek's team changed his engine after it failed in the second qualifying event. Stremme paced the fifth practice session with a 47.038 seconds, 0.001 seconds faster than Robby Gordon in second. Harvick, Green, Elliott, Ken Schrader, McMurray, Kasey Kahne, Earnhardt and Kurt Busch followed in the top ten. In the final practice session, which took place in warm weather conditions that prompted drivers to limit their running to preserve their cars, Schrader recorded the fastest lap of the Daytona 500 meeting at 46.708 seconds; Martin Truex Jr. was second and Earnhardt third. Green placed fourth, Lepage came fifth and Jarrett sixth. Marlin, Petty, Burton, and Brent Sherman completed the top ten ahead of the race. Though the session passed without a major incident, Bobby Labonte's engine failed late in practice, and his team changed engines. Vickers glanced the turn three wall but he resumed without any substantial car damage. As Nemechek's crew prepared for the event at 9:00 am, his car had a small engine compartment fire after oil-covered tire rubber in his exhaust header ignited, prompting his team to change the wiring harness and the aluminium heat shield beside the engine's header. Live television coverage of the race began at 1:30 pm EDT in the United States on NBC. Around the start of the race, weather conditions were overcast and cool; forecasts predicted an air temperature of 65 °F (18 °C) and cloudy conditions. Ronald Durham, pastor of Greater Friendship Missionary Baptist Church in Daytona Beach, Florida, began pre-race ceremonies with an invocation. Hip-hop singer Fergie of The Black Eyed Peas performed the national anthem, and actor James Caan commanded the drivers to start their engines. During the pace laps, Labonte and Nemechek moved to the rear of the field because they changed their engines, and Marlin did the same after he switched to a back-up car. 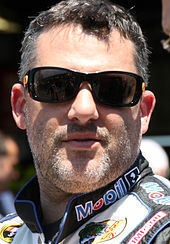 Tony Stewart (pictured in 2015) led 20 laps and was later penalized for contact with Matt Kenseth on lap 107. The race began at 2:45 pm. Burton maintained his pole position advantage to lead the field into the first turn. In turn three, Green's left-rear tire went flat; no caution was prompted because the carcass rolled into the infield grass. By lap three, two distinct packs of cars were established, with 27 vehicles in the lead pack, and the second was five seconds behind the first bunch of cars. Earnhardt made it three abreast through the tri-oval on the fifth lap, but it returned to being two abreast entering the back straightaway. After starting 26th, Harvick advanced to tenth by lap nine, and Petty had dropped seventeen positions over the same distance. The top three cars established a single file on lap 15, with the next six rows two abreast. Two laps later, the first caution was given; Vickers lost control of his car leaving turn two, and Truex served to avoid him, although Vickers made heavy contact with the outside wall, causing his car's right side sheet metal to rub against the right rear tire. During the caution, the field (including Burton), made pit stops for fuel and tires. Sadler led Earnhardt at the lap-21 restart. One lap later, Earnhardt steered to the outside line to attempt a pass on Sadler without drafting assistance, but he was unsuccessful and dropped back. Gordon became the new leader on the 24th lap and Sadler fell to fourth. On lap 25, Kenseth assumed the first position by overtaking Gordon, with Earnhardt second and Stewart third. Earnhardt took the lead from Kenseth two laps later, as Stewart got loose in turn two, and slid up towards Kenseth but he regained control of his car. On the 28th lap, Stewart was provided with drafting assistance by McMurray to pass Earnhardt for first. Six laps later, Mike Wallace came over into Mayfield, who in turn, went into Biffle, but no caution was needed. Mayfield went down pit road for repairs on the same lap. He made a second pit stop on lap 38 because his right-front tire was cut from a fender. On lap 40, Stewart continued to run in first, with McMurray in second. Mayfield made a third pit stop for sheet metal repairs on the next lap. On the 48th lap, just after Stewart lost the lead to McMurray, Gordon lost control of his vehicle and made contact with Stewart's front. Both were sent into the outside wall exiting the second turn, and sustained right-hand side damage. The field (including McMurray) elected to make pit stops under caution. McMurray sustained metal sheet damage from being dropped of his team's jack, and Edwards had repairs to the front of his car made. As fog descended on the track between turns one and three and reduced visibility, Newman led the field at the lap 52 restart, followed by Kenseth. Six laps later, Newman received assistance from Kyle Busch to take the lead from Kenseth. Kyle Busch dropped down the order from the 61st lap, while Kurt Busch moved to third. By the 75th lap, Stewart returned to 13th place. Four laps later, a multi-car collision caused a third caution. Green lost control of his car from contact with Jarrett, and slid upwards in turn three, and into J. J. Yeley's path. Nemechek was collected, and the front of Edwards' car temporarily mounted Petty's left-side fender, with both sliding into the infield grass at turn three. Dale Earnhardt Jr. (pictured in 2002) led more laps than any other driver in the Daytona 500 (32). The leaders (including Kenseth) made pit stops during the caution. Kurt Busch and Travis Kvapil both staggered their pit stops, leading one lap each before making their pit stops. Racing resumed on lap 85 with the first position held by Kenseth and Harvick in second. That lap, as the field spread out in turns one and two, Harvick passed Kenseth to claim the lead. Earnhardt went to the inside lane and he used Nemechek's slower car to get ahead of Harvick for first place on lap 86. Four laps later, Kenseth received drafting assistance from Kurt Busch to reclaim the first position from Harvick on the outside lane. A fourth caution was prompted when a spring rubber was located on track during lap 91. The leaders (including Kenseth) chose to make pit stops during the caution. Earnhardt led at the lap 96 restart. Entering turn three on the lap, Kenseth overtook Johnson to move into second. Martin received drafting assistance from Stewart, and he overtook Earnhardt on the outside for the first position on the 104th lap. The fifth caution was waved on lap 107. Stewart turned left, making contact with the front of Kenseth's car entering the third turn. This sent Kenseth into the infield grass and went backward onto the track in turn three and hit no other vehicle en route to glancing the wall. The field (including Martin) chose to enter pit road during the caution period. Earnhardt took the lead after all cars made their pit stops. In the meantime, Stewart was sent to the end of the longest line for "aggressive driving". As Stewart and Kenseth exited pit road, Kenseth turned to the outside going into turn one, and he hit the right-hand side of Stewart's car. NASCAR subsequently ordered Kenseth to serve a drive-through penalty. The race resumed on lap 112, with Earnhardt leading a lap before Biffle overtook him. Kenseth disputed his penalty and he remained on track until the 114th lap. Earnhardt retook the lead for two laps, before Kyle Busch assumed the first position between laps 116 and 120 until Johnson got ahead of him on lap 121. On lap 124, Robby Gordon's right-front tire failed in turn three, and he hit the wall, triggering the sixth caution. During the caution, the field (including Johnson) went down pit road. Elliott led the field on lap 126 before making his pit stop. Stewart drove over his pit stall jack, and was ordered to drop to the end of the nearest longest line. Martin led at the lap 129 restart, followed by Johnson. That lap, Johnson attempted to pass Martin on the outside lane but was unsuccessful. Martin then pulled away with drafting aid from Earnhardt as the top six formed a single line by lap 132. Earnhardt took the lead back ten laps later, and Vickers passed his teammate Johnson on the outside on lap 143. On the following lap, Vickers took the lead. Lap 155 saw the seventh caution; debris was located in the groove on the frontstretch. All of the leaders (including Vickers) made pit stops under caution. Johnson went into the grass to avoid hitting Newman. Earnhardt led Vickers and Newman at the lap 160 restart. Newman passed Earnhardt on the outside for the lead four laps later but Earnhardt retook it temporarily. On lap 167, Kurt Busch moved to second. Jimmie Johnson (pictured in 2007) led 24 laps and took his first Daytona 500 victory and the 19th of his career. Kahne helped Earnhardt move into second on lap 171. Five laps later, Kvapil's right front tire burst, causing him to crash into the turn three outside wall, and prompting the eighth caution. During the caution, all cars (including Newman) went down pit road. Vickers led at the lap 181 restart after having no tires fitted to his car. Every driver, except for Kyle Busch and Kurt Busch, went to the inside lane. Just as Johnson overtook his teammate Vickers on the outside in turn two for the lead with Newman's help, the ninth caution was waved on the 187th lap, when McMurray hit the left-rear of Kurt Busch's car on the backstretch, sending Busch into the barrier. Marlin and Jeff Gordon were collected and debris hit Stewart's car. Johnson maintained the lead at the restart on lap 190. Newman bump drafted Vickers for two laps, before passing him for second, and attempted to challenge Johnson. Casey Mears then overtook Vickers for third. Johnson led the next seven laps before a tenth caution flag was necessitated for an accident. Burton drifted up on the backstretch, and hit McMurray, causing Burton to collide with the wall. Burton went down into Bobby Labonte's right-hand side, causing both drivers to hit the wall, and Labonte collected Hamlin. During the caution, one of Newman's mechanics went to speak to representatives from Mears' and Sadler's teams, imploring them to get their drivers to draft Newman on the outside at the restart. Both declined because of the opportunity of winning the Daytona 500. The race restarted on the 202nd lap for a green–white–checker finish (extending the race to 203 laps), with Johnson leading Newman and Mears, and the trio drew clear from the field. Sadler and Earnhardt achieved a good run to get back to the first three cars. On the final lap, Earnhardt attempted to advance his position by going to the outside lane but he fell back. Then, Newman attempted to pass Johnson on the outside, but Mears remained with Johnson rather than draft Newman. In turn four, Biffle spun and hit the turn four wall, causing the eleventh (and final) caution. The field was frozen in place, with the order of finish determined by where the drivers were when the caution began. This gave Johnson the victory, his first in the Daytona 500, and at a restrictor plate track (at either Talladega Superspeedway and Daytona International Speedway), and the 19th of his career. Mears finished second, ahead of Newman in third, Sadler in fourth, and Stewart in fifth. Bowyer, Vickers, Earnhardt, Schrader, and Jarrett completed the top ten finishers. There were eleven cautions and 32 lead changes among a record-breaking 18 different drivers during the race. Earnhardt's 32 laps led was the most of any competitor. Johnson led four times for a total of 24 laps. "The racer in me wanted to push and be aggressive out there. And there were so many times I just told myself to stop. Don't get caught up in this. I really did a lot of talking to myself. And ultimately I hope that I learned something today that will help me win a championship. In my eyes, I wonder if I've been trying too hard and this team's been trying too hard. If we just sit down and be calm and relaxed, do our job 100 percent, that we will accomplish what we want to." Jimmie Johnson, on winning the 48th Daytona 500. Johnson appeared in Victory Lane to celebrate his first Daytona 500 victory in front of the crowd of 200,000 spectators; the win earned him $1,505,124. He spoke of his belief that his team would win without Knaus and dedicated it to his detractors, "I just have so much pride in my team with the circumstances that we've faced this week. Chad made a mistake and we're dealing with the consequences that come with that. But I think this shows how hard we work to be successful, and nobody can deny the fact that we worked out butts off and won the sport's biggest race." Mears said he was happy to take second, the fifth top-five finish of his career, "These races are so hard to get good finishes in [because] so many people can affect the outcome. Obviously we would have liked to have won [because] it would have forced Chip and Felix [Sabates, team co-owner] to put me in the Indy 500, which would have been a lot of fun. At the end of the day, it was a good finish for us, we had an excellent day and I couldn't be happier -- unless we won." Third-placed Newman told Mears after the race, "You cost me a million dollars", but said he was proud to attempt a pass for the win, "I told the guys over the radio afterward, if I had that run and didn't take it, I would have had a hard time sleeping tonight -- probably for the next 10 or 15 years, maybe -- you never know." With regards to the uncertainty whether Johnson would be allowed to retain the victory, Johnson was confirmed as the winner several hours later since his car passed post-race inspection. Newman noted that three of Johnson's previous wins came under scrutiny from NASCAR, "This could still be the first opportunity for NASCAR to pull away a victory if the thing is illegal, I think a lot of Jimmie Johnson and his talent ... but I'm pretty sure that three of his past four wins have had conflict with the cars being illegal. It's not necessarily good for the sport." Johnson responded by targeting Newman's crew chief Matt Borland, and said that he would be defend against personal criticism and that to Hendrick Motorsports. Mears spoke his belief that Johnson earned the victory, "In my mind, the fact that they got caught earlier in the week took away every doubt in my mind that they'd actually do anything to cheat in this race." Hendrick Motorsports founder and owner Rick Hendrick declared Knaus' ejection from the race as not important and said of the issue, "We've been through inspection I don't know how many times. NASCAR did what they did, and we came back and ran two races. That was history." Two days after the race, NASCAR announced penalties for Hendrick Motorsports and Hall of Fame Racing. 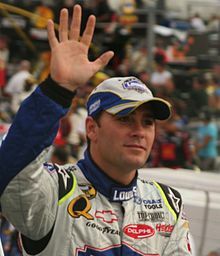 Hendrick Motorsport's penalties for "actions detrimental to stock car racing", and for making an unapproved template modification to Johnson's rear window, included a $25,000 fine for Knaus, who was suspended from NASCAR until March 22, 2006. Knaus was also placed on probation until December 31, 2006, although Hendrick Motorsports did not incur any points penalties. The team did not appeal the penalties and Grubb continued in Knaus' role until the Golden Corral 500. Hall of Fame Racing's penalties were for "actions detrimental to stock car racing", and for having a non-compliant carburetor in accordance to the 2006 NASCAR Rule Book. Crew chief Philippe Lopez was fined $25,000, and Terry Labonte and team owner Bill Saunders were penalized 25 points in the Drivers' and Owners' Championships. Hall of Fame Racing and its partner Joe Gibbs Racing announced they would appeal their penalties. The appeal was heard before a three-member National Stock Car Racing Commission on March 7 at NASCAR's Research & Development Center in Concord, North Carolina. All three upheld the penalties. Hall of Fame Racing decided not to appeal further to the NASCAR National Commissioner Charles D. Strang. Kenseth accused Stewart of eliminating him from contention purposefully on lap 107, and was disenchanted with him as he urged NASCAR to address bump drafting, "There's no two ways about it. He was mad because earlier in the race when I passed him he got loose, which I didn't think I did anything wrong." Stewart argued Kenseth caused the crash, "I guess Matt didn't think anything when he got me sideways over in (Turn) 2, either. He should have thought about that first. He got back what he started in the first place. I got penalized for that." McMurray commented on his accident with Kurt Busch on lap 187, "I need to apologize to Kurt. I got into him, that was 100 percent my fault and I feel really bad because he had a car capable of winning and I kind of screwed that up for him." Earnhardt, who led the most laps of any driver with 32, said he was pleased after finishing ninth, "We had a great race car, built by all the technology and resources at DEI. … We came down here and ran great. That's what we wanted to do. I'm real proud of everybody back at the shop and all my guys down here that have been working on this car all week. It's been a long week." Because this was the first race of the season, Johnson led the Drivers' Championship with 185 points, followed by Mears in second with 170 points, and Newman placed third with the same number of points. Sadler and Stewart were fourth and fifth with 165 and 160 points, respectively. Earnhardt, Vickers, Bowyer, Schrader, and Jarrett rounded out the top ten. In the Manufacturers' Championship, Chevrolet led with nine points, Dodge was in second with six points, and Ford followed in third with four points. The race attracted a television audience of 37 million viewers; it took three hours, 33 minutes, and 26 seconds to complete; because it ended under caution, no margin of victory was recorded. ^ Defending series champion Tony Stewart missed testing to compete at the Chili Bowl, and Brian Vickers was sidelined because of a sports hernia operation. ^ a b c d e f g h i j k l m n o p q r s "The Race: The Daytona 500". Jayski's Silly Season Site. Archived from the original on March 15, 2006. Retrieved April 3, 2019. ^ a b c d e f g h i j k l m n "2006 Daytona 500". Racing-Reference. Retrieved November 24, 2015. ^ "Weather Information for Daytona Beach, Florida". Old Farmer's Almanac. Retrieved June 19, 2013. ^ a b "2006 NASCAR Nextel Cup TV Ratings". Jayski's Silly Season Site. Archived from the original on November 30, 2006. Retrieved January 6, 2015. ^ Peltz, Jim (February 10, 2006). "All Eyes on the Daytona 500". Los Angeles Times. Retrieved April 2, 2019. ^ "NASCAR Race Tracks". NASCAR. Archived from the original on January 5, 2013. Retrieved December 20, 2011. ^ "Daytona International Speedway". ESPN. June 27, 2011. Archived from the original on January 20, 2012. Retrieved June 25, 2015. ^ a b "Daytona 500 History". TicketCity. Archived from the original on May 9, 2012. Retrieved June 24, 2015. ^ Bonkowski, Jerry (February 23, 2014). "Everything you've ever wanted to know about the Daytona 500 (well, almost)". NBC Sports. Archived from the original on March 6, 2014. Retrieved June 24, 2015. ^ "Restrictor Plate History Chart". Jayski Silly Season Site. Archived from the original on May 5, 2015. Retrieved June 24, 2015. ^ Spencer, Lee (January 8, 2006). "Inside Dish: Stewart foregoes testing for Chili Bowl". Sporting News. Archived from the original on April 15, 2006. Retrieved April 3, 2019. ^ Caraviello, David (January 26, 2006). "Hendrick 'on a mission' to get four cars in Chase". The Post and Courier. Archived from the original on March 1, 2006. Retrieved April 3, 2019. ^ DeCotis, Mark (January 9, 2006). "New rules add intrigue to Daytona testing". Florida Today. Archived from the original on February 16, 2006. Retrieved April 3, 2019. ^ a b "2006 Nextel Cup Testing News – Daytona 500 – Days 1–3, Jan. 9–11". Jayski's Silly Season Site. Retrieved November 24, 2015. "2006 Nextel Cup Testing News – Daytona 500 – Days 4–6, Jan. 14–16". Jayski's Silly Season Site. Retrieved November 24, 2015. ^ Blake, Ben (January 10, 2006). "Elliott on Top as Tests Commence at Daytona". Speed. Archived from the original on January 13, 2006. Retrieved April 3, 2019. ^ "Gordon goes fastest at Daytona". Autosport. January 11, 2006. Retrieved April 3, 2019. ^ Engle, Greg (January 11, 2006). "LIVE Daytona Blog: Day 3". CupScene. Archived from the original on January 13, 2006. Retrieved April 3, 2019. ^ "Week 2: Daytona Nextel Cup Monday test speeds". Fox Sports. January 17, 2006. Archived from the original on January 25, 2006. Retrieved April 3, 2019. ^ a b James, Brant (February 15, 2006). "NASCAR to police bump-draft". St. Petersburg Times. Archived from the original on March 22, 2006. Retrieved April 3, 2019. ^ Redmayne, Tim (February 14, 2006). "NASCAR acts on bump drafting". Autosport. Retrieved April 3, 2019. ^ "Practice 1 Timing and Scoring". NASCAR. Archived from the original on August 6, 2006. Retrieved November 24, 2015. ^ "NASCAR Practice #2 Speeds for the 2006 Daytona 500 at Daytona International Speedway". Fantasy Racing Cheat Sheet. Archived from the original on April 30, 2016. Retrieved April 3, 2019. ^ Redmayne, Tim (February 11, 2006). "Sadler tops times in practice 2". Autosport. Archived from the original on April 3, 2019. Retrieved April 3, 2019. ^ Harris, Mike (February 13, 2006). "Burton on 500 pole". The Spokesman-Review. Associated Press. Archived from the original on April 3, 2019. Retrieved April 3, 2019. ^ DeCotis, Mark (February 11, 2006). "Nothing simple about Daytona 500 qualifying". Florida Today. Archived from the original on February 22, 2006. Retrieved April 3, 2019. ^ a b Fabrizio, Tony (February 13, 2006). "Burton Ends Drought By Capturing Daytona 500 Pole". The Tampa Tribune. Archived from the original on March 22, 2006. Retrieved April 3, 2019. ^ Erwin, Jill (February 13, 2006). "Burton claims pole". Richmond Times-Dispatch. Archived from the original on June 11, 2006. Retrieved April 3, 2019. ^ "Burton wins Pole". Eurosport. February 13, 2006. Archived from the original on April 3, 2019. Retrieved April 3, 2019. ^ a b "Burton wins pole for Daytona 500". United Press International. February 12, 2006. Archived from the original on April 3, 2019. Retrieved April 3, 2019. ^ "Jeff Burton sails to Daytona 500 pole". motorsport.com. February 13, 2006. Archived from the original on April 3, 2019. Retrieved April 3, 2019. ^ a b Newton, David (February 12, 2006). "Knaus facing suspension after 48 fails inspection". NASCAR. Archived from the original on May 14, 2006. Retrieved April 3, 2019. ^ Dilner, Bob (February 13, 2006). "Johnson's pole roll disqualified; Burton's engine examined". Fox Sports. Archived from the original on February 28, 2006. Retrieved April 3, 2019. ^ a b Hinton, Ed (February 14, 2006). "NASCAR suspends Knaus". Orlando Sentinel. Archived from the original on April 3, 2019. Retrieved April 3, 2019. ^ "Practice 3 Timing and Scoring". NASCAR. Archived from the original on September 7, 2006. Retrieved April 3, 2019. ^ Redmayne, Tim (February 15, 2006). "Earnhardt tops penultimate practice". Autosport. Archived from the original on April 3, 2019. Retrieved April 3, 2019. ^ "Practice 4 Timing and Scoring". NASCAR. Archived from the original on September 7, 2006. Retrieved April 3, 2019. ^ "Vickers fastest in final Gatorade build-up". Crash. February 16, 2006. Archived from the original on April 3, 2019. Retrieved April 3, 2019. ^ a b Fryer, Jenna (February 17, 2006). "Veterans grab victories in Daytona duels". Tulsa World. Associated Press. Archived from the original on April 3, 2019. Retrieved April 3, 2019. ^ Livingstone, Seth (February 17, 2006). "Marlin will drive his backup car at Daytona". USA Today. p. 05C. Retrieved April 3, 2019 – via Biography in Context. (Subscription required (help)). ^ a b c d e Engle, Greg (February 19, 2006). "Live: Daytona Sunday Blog". Cup Scene. Archived from the original on June 29, 2006. Retrieved April 3, 2019. ^ "NASCAR Practice #5 for the 2006 Daytona 500 at Daytona International Speedway". Fantasy Racing Cheat Sheet. Archived from the original on April 3, 2019. Retrieved April 3, 2019. ^ Harmon, Rick (February 19, 2006). "High Temperatures At Daytona Limit Drivers' Practice Runs". The Tampa Tribune. Archived from the original on March 22, 2006. Retrieved April 3, 2019. ^ a b c Redmayne, Tim (February 18, 2006). "Schrader tops final practice". Autosport. Archived from the original on April 3, 2019. Retrieved April 3, 2019. ^ a b Poole, David (February 19, 2006). "With Marlin hobbled, Elliott's the old-school pick". Charlotte Observer. Archived from the original on March 23, 2006. Retrieved April 3, 2019. ^ a b c d e f g h i j k l m n o p q r s t u v w x y z aa ab Finnegan, Mike (February 19, 2006). "Johnson is Lowe and Improved at Daytona". SpeedwayMedia. Archived from the original on May 7, 2006. Retrieved April 2, 2006. ^ a b c d e f g h i j k l m n o p q r s t u v "Lap-by-Lap: Daytona". NASCAR. February 19, 2006. Archived from the original on September 7, 2006. Retrieved November 24, 2015. ^ a b c d e Fofaria, Rupen (February 20, 2006). "Johnson overcomes odds, late rush to win 500". ESPN. Archived from the original on April 4, 2019. Retrieved April 4, 2019. ^ a b Poole, David (February 19, 2006). "Caution assures Johnson's Daytona 500 win". Charlotte Observer. Archived from the original on March 23, 2006. Retrieved April 4, 2019. ^ a b c Ryan, Nate (February 19, 2006). "Day of atonement at Daytona for Jimmie Johnson". USA Today. Archived from the original on May 13, 2006. Retrieved April 4, 2019. ^ a b c d Bernstein, Viv (February 20, 2006). "Victory at Daytona Has Stigma Attached". The New York Times. Archived from the original on April 10, 2015. Retrieved April 4, 2019. ^ a b Redmayne, Tim (February 19, 2006). "Johnson wins thrilling Daytona 500". Autosport. Archived from the original on April 4, 2019. Retrieved April 4, 2019. ^ "Johnson earns his first Daytona 500 win". motorsport.com. February 21, 2006. Retrieved April 4, 2019. ^ a b Rodman, Dave (February 20, 2006). "Mears, Newman pleased with Daytona 500 runs". NASCAR. Archived from the original on March 19, 2006. Retrieved April 4, 2019. ^ a b Poole, David (February 21, 2006). "NASCAR suspends Chad Knaus, comes down hard on 96 team". Charlotte Observer. Archived from the original on March 23, 2006. Retrieved April 4, 2019. ^ a b Long, Dustin (February 21, 2006). "Johnson's crew chief fined, gets probation". The Virginian-Pilot. Retrieved April 4, 2019. ^ Blount, Terry (March 7, 2006). "HOF Racing appeal denied". The Dallas Morning News. Archived from the original on August 21, 2006. Retrieved April 4, 2019. ^ "Engine, tires make a bad day for Newman: No appeal". ESPN. Associated Press. March 12, 2006. Archived from the original on March 14, 2006. Retrieved April 4, 2019. ^ a b Livingstone, Seth (February 19, 2006). "Stewart finds plenty of trouble during his Daytona 500". USA Today. Archived from the original on May 10, 2008. Retrieved April 4, 2019. ^ Readling, Mike (February 20, 2006). "Crashes make McMurray public enemy No.1". St. Petersburg Times. Archived from the original on November 11, 2006. Retrieved April 4, 2019. ^ Fofaria, Rupen (February 20, 2006). "Earnhardt Jr. happy with run in the top 10". ESPN. Archived from the original on November 11, 2014. Retrieved April 4, 2019. ^ a b "2006 Official Driver Standings: Daytona 500". NASCAR. Archived from the original on March 19, 2006. Retrieved April 4, 2019. ^ a b "Manufacturers' Championship Classification". Jayski's Silly Season Site. Archived from the original on February 12, 2007. Retrieved January 6, 2015. ^ "Race Lineup: Daytona 500". NASCAR. Archived from the original on April 27, 2006. Retrieved April 4, 2019. ^ "Jayski's Semi-Live Qualifying/Grid page for the Daytona 500 at Daytona International Speedway". Jayski's Silly Season Site. Archived from the original on March 15, 2006. Retrieved April 4, 2019.